Like that day almost 50 years ago, could today be the day that ObjectARX has died? Thank you for your interest in development tools for Autodesk’s products. If you are not already an Autodesk developer partner, be sure to visit the Autodesk Developer Network website at http://www.autodesk.com/joinadn to learn more. As a member, you can access timely technical information, training and support to help you stay competitive. If you are looking for self-help resources for your Autodesk software-based development efforts, visit our Support page at http://www.autodesk.com/support or access the ObjectARX newsgroup at news://discussion.autodesk.com/autodesk.autocad.objectarx. 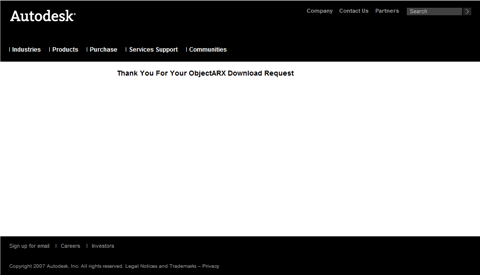 Putting two and two together, it looks to me like the ObjectARX SDK is no longer freely available. It’s not altogether surprising that Autodesk would try something like this in an (almost certainly misguided) attempt to make it more difficult for organizations like the Open Design Alliance to reverse engineer the API. If this is true, I foresee a major sea change with a ripple effect that will change the face of third party add-on development. It’s a risky legal maneuver, first of all. Any time a large corporation like Autodesk picks and chooses who it will do business with, it risks running afoul of the Sherman Antitrust Act. Secondly, the practical effect of limiting access to Autodesk’s SDK will be to give Open Design Alliance more influence vis à vis its DRX SDK. For now, there is not too much of an immediate impact. AutoCAD 2009 is binary compatible with AutoCAD 2007 and AutoCAD 2008, so software developed with those SDKs will work in AutoCAD 2009 (of course without utilizing the new features). Therefore, development of AutoCAD 2009 software can continue with only a minor hit. The problem will not be felt until the next release of AutoCAD, which presumably will no longer be binary compatible. Where is all this headed? I’m still holding out hope that it’s all a big misunderstanding; otherwise we’re headed for some upheaval in the AutoCAD add-on industry.